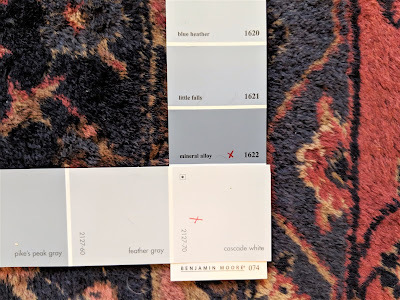 I've been searching for a living room area rug, something to use as a foundation for the design scheme. I'm having trouble settling upon a choice. I don't want to invest a great deal in a rug. 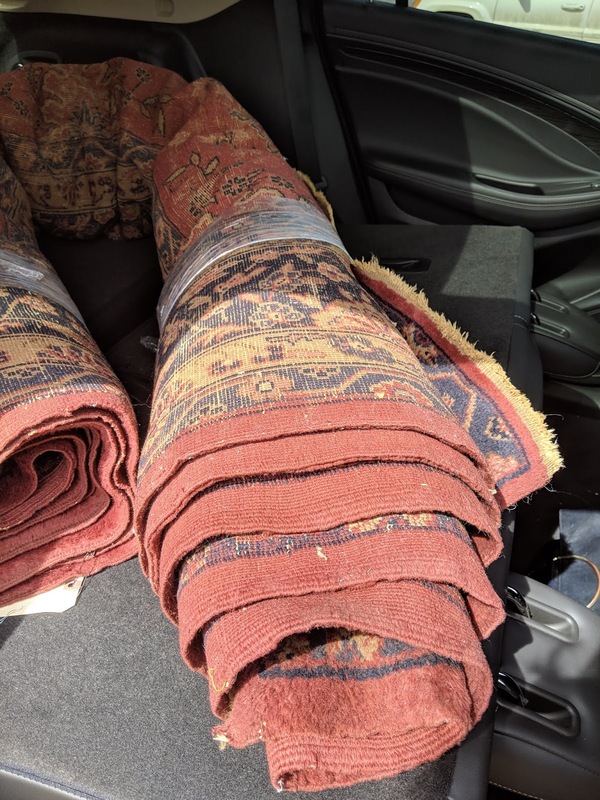 Often, rugs are a true investment. I'm looking for something inexpensive. I'm uncertain if I want color or something neutral with a lot of pattern. We have an antique Persian rug, which was an investment, I want something that will work with that rug. Maybe something with a modern edge would add an interesting juxtaposition to the room? I often peruse Everything But The House, website here. 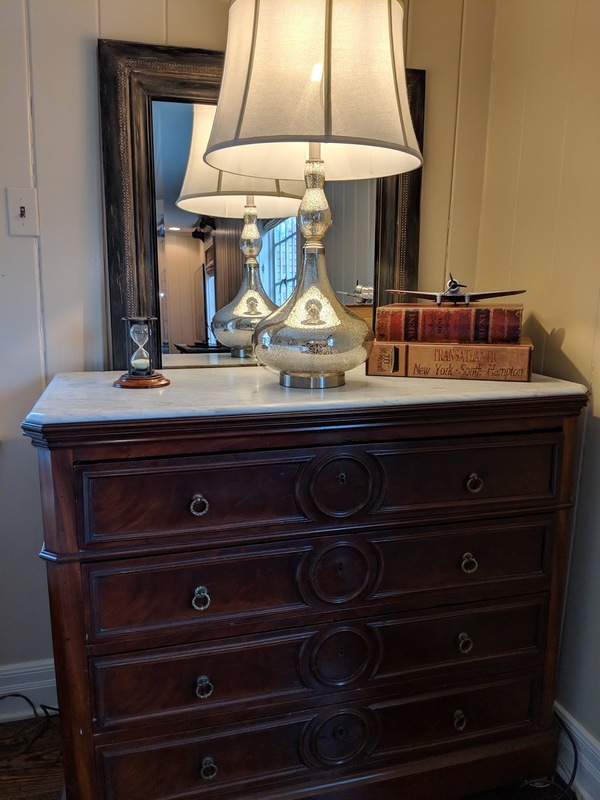 If you haven't visited, it's an online estate sale auction. Items are dropped at their warehouses for online auction. There are some amazing opportunities, also lovely things to look at, you can shop in your jammies. We have a EBTH warehouse in Dallas, which is about an hour and half drive from our little town. 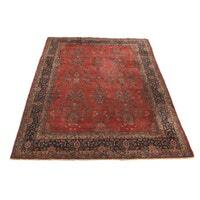 When a 9 X 12, vintage rug was posted that appeared rust or orangey red, I was interested. 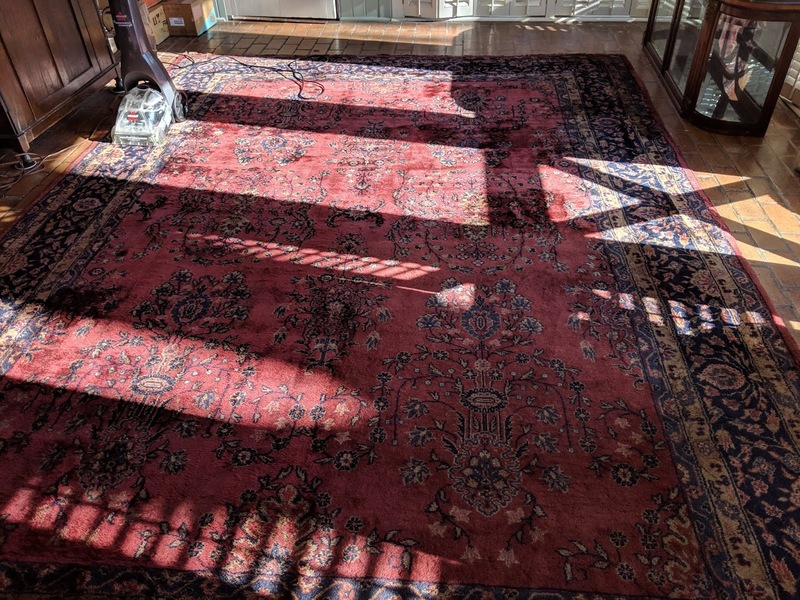 I stalked it the four days the rug was available, then bid and won it just as time was running out. I was excited. A few days later Jr. and I made our way to Dallas to retrieve the treasure. When the rug was brought to the dock I realized it wasn't rust, clay, orange red at all. The color was a soft wine, raspberry. I'm not a pink fan. I couldn't hide my disappointment. Whatever I think tends to flash across my face. I don't play poker for that very reason. We began our journey home. Jr asked "Don't you like the rug? ", to which I responded "It's a pretty rug. It was an excellent buy. I honestly thought it was a warmer red.". There was silence. Then "Could I have it? I think it's great, I like the color." Well - there you go. A few shampoo sessions, and a heave ho up the stair well, the rug came to rest upon Jr's floor. We spent a few hours moving his furniture around. 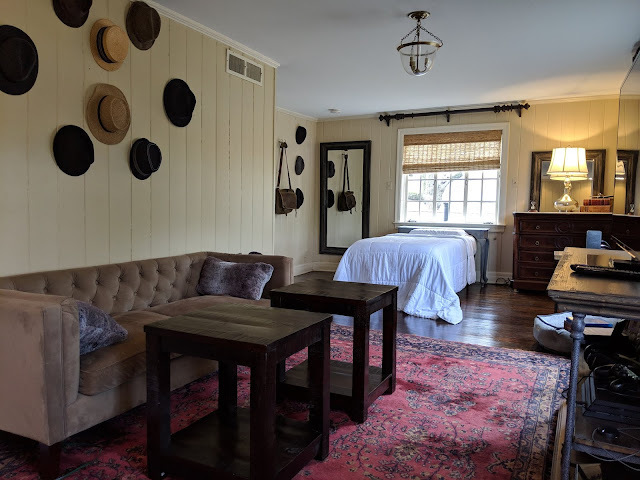 His room is long and narrow; 14' wide by 9.5' then 10.5 feet wide by 17.5 long (the entire room is 27' long and wider at one end.). Opposite the wide end there is a niche next to a closet, two recessed lights are in the ceiling making the niche perfect for his desk. 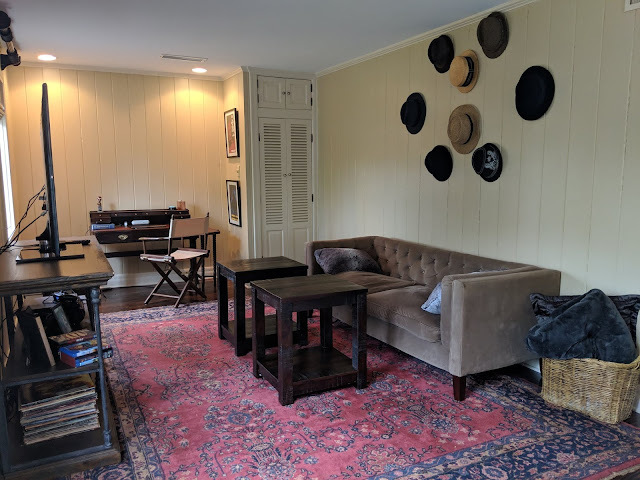 We tried different ideas, ultimately separating his room into two sections; a living space in the longer narrow section, then sleeping space in the wider smaller section. The entry door separates the two spaces. 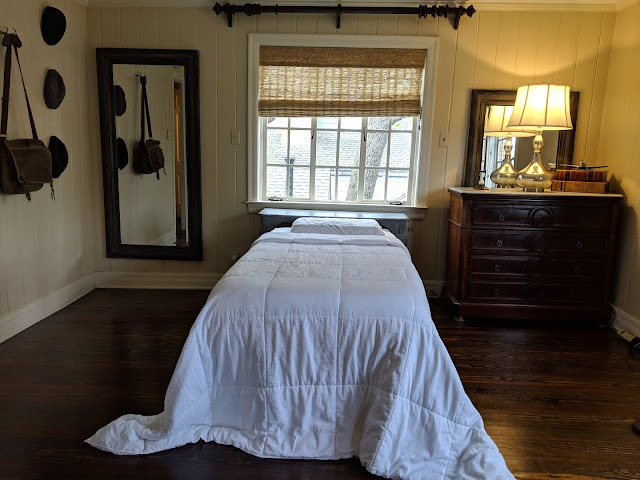 We removed the inherited drapes from the previous owner, uncertain what we will do with window treatments. We hung a few of his hats upon the wall so he'd feel at home. We sat there looking at the raspberry rug, as a discussion around a design plan began blooming. 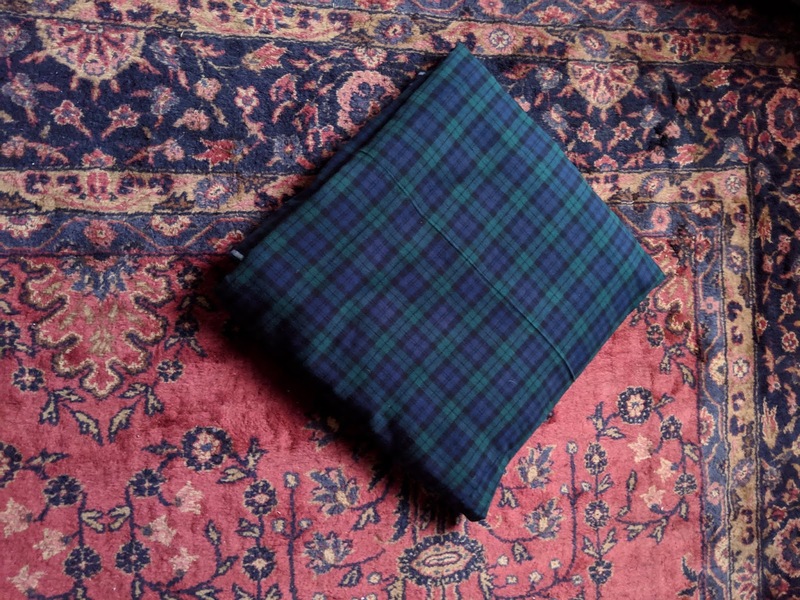 We purchased blue, green, black watch plaid flannel fabric some years ago for his bedding. It was an idea that I never finished. He wondered if the fabric would work with the rug. I retrieved it from a still packed box, we took a look and both like it. 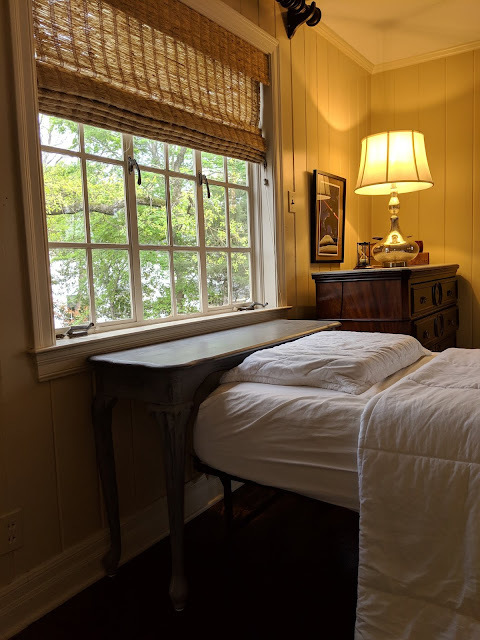 We placed his bed beneath a window, using a sofa table as a "headboard" of sorts; a space for books, lamp, or to rest his phone. 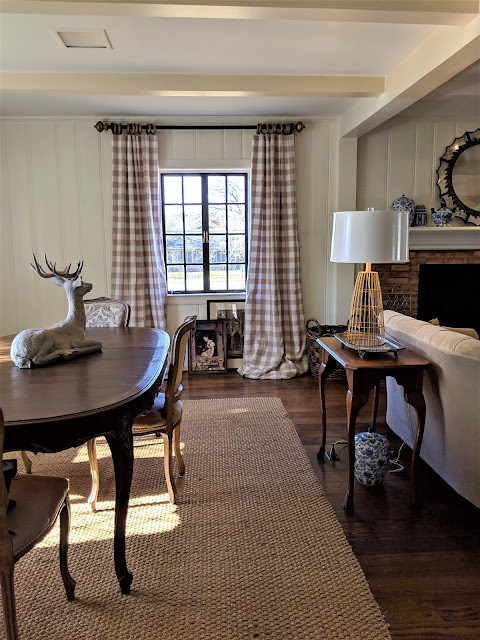 We think a plaid canopy around the window will create a lovely focal point. 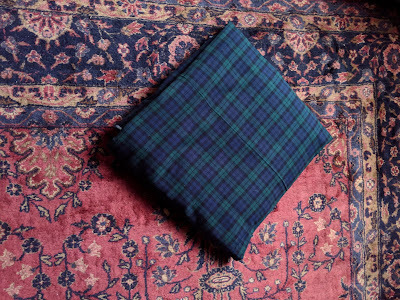 A duvet of the same plaid will complete the look. We hung his beret and "newsboy" hats, added a hook for his book bag, then one of a pair of mirrors so he can check himself before walking out the door. I felt adding the second mirror behind the dresser would bounce the light from the lamp back into the space. Mirror isn't hung yet it will be the same height as its partner. 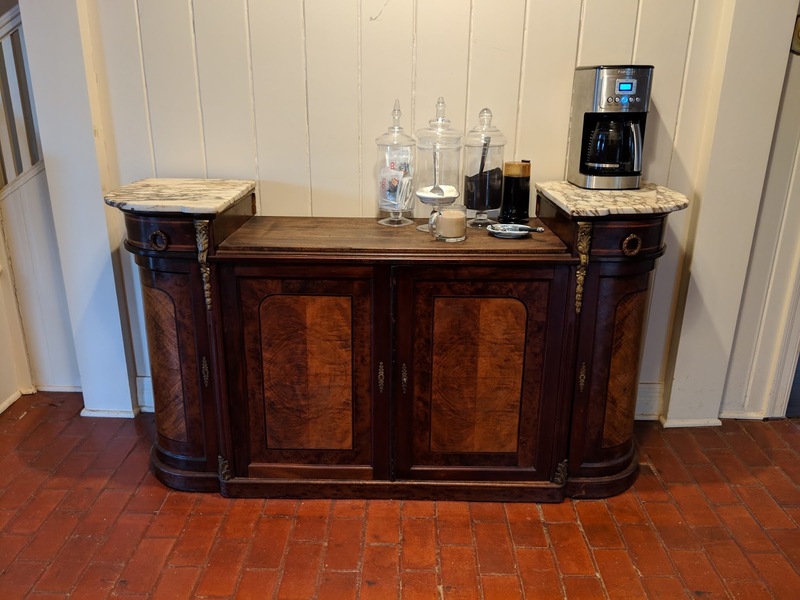 He posed another question about an antique French style two tier (two height) buffet I found at an estate sale in town. It was a steal. One of those moments when you happen upon something and it speaks to you. I literally was unable to walk away, though I had no idea where it would find a home in our cottage. 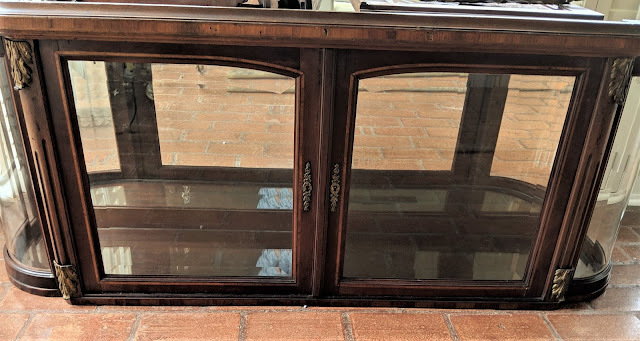 It was missing the back mirror that supports the upper cabinet. Sitting at the sell, it's upper cabinet balanced upon its raised shelves, the center marble top had been replaced with wood, it looked lost. I could almost feel it reaching out to me, it was wounded - so I adopted it. "Have you decided about the buffet?" he posed the question in a curious tone. Being coy I responded "What buffet?" which resulted in a frown. Of course I knew what buffet. "Why?" I asked. "Well, I was thinking, would it work for my TV?" I like this idea very much. It would make a beautiful cabinet for his TV, the lower storage space useful for records, games, DVDs. For the moment it is assigned to coffee duty. I have a longer gorgeous piece coming soon, the buffet base has been working well temporarily filling in. The top tier cabinet has bowed glass ends and mirrored back. I think the bits of ormolu are what attracts him to the buffet. It has a little crown that fastens to the center top of the cabinet. We plan to utilize the support pieces that would have been used as the foundation for the upper cabinet. Each piece is intricate, the legs feature ram heads, a laurel and garland. 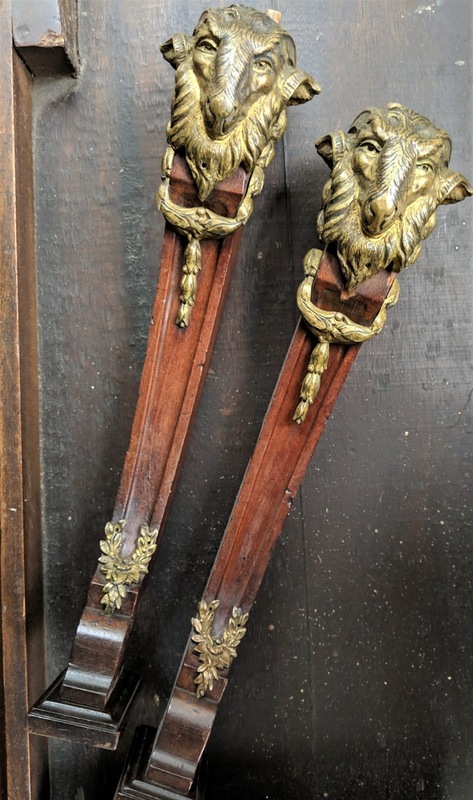 The brackets have burlwood insets, marquetry, also ormolu upon the edge. They may become wall art, sculpture or accessories. The legs for the top tier glass cabinet. The brackets that would have supported the back of the upper glass cabinet, along with the crown for the upper cabinet. We think separating the base from the upper cabinet at this time will serve Jr.'s needs well. 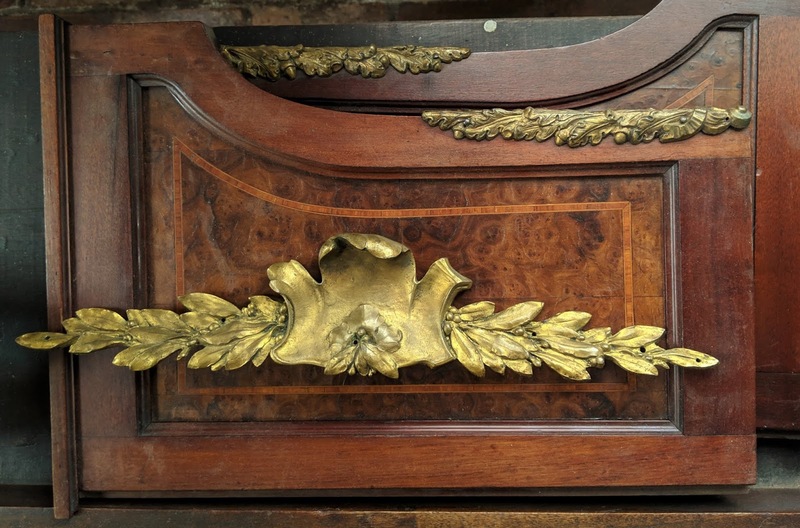 Eventually he may chose to have a reproduction of the missing section made, so that he can reconstruct the buffet in it's original form. Our cabinet is Louis XV, likely early 1900's to 1910, it appears the glass is original, uncertain if the ormolu is brass or bronze. 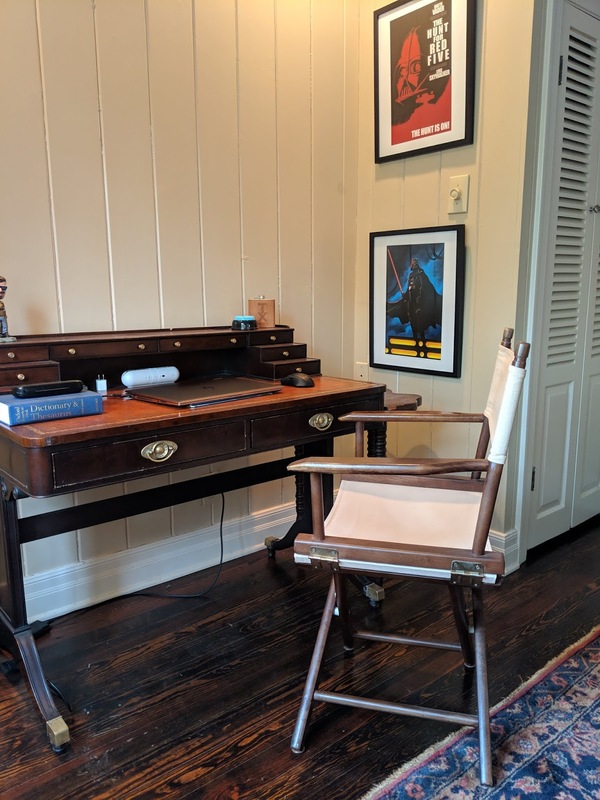 We purchased an antique desk for him shortly after we moved, because he agreed to sell his previous desk with our house. We found a campaign style desk on Craig's list, that resulted in a trip to NW Texas, where we met a lovely couple and retrieved the desk. He polished the brass pulls and feet. Jr. likes shiny brass. We've decided to do something a little different. 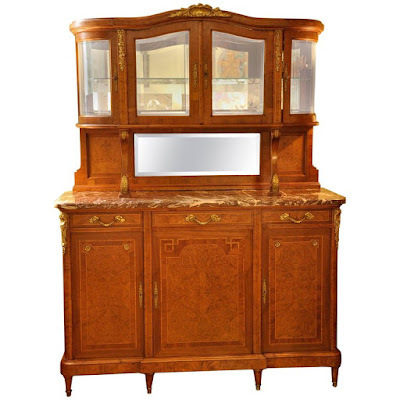 We plan to hang the upper cabinet from the two tier buffet above the campaign desk. He'll be able to use the cabinet for books, as well as display. The cabinet is a little longer than the desk, we think it will be interesting. 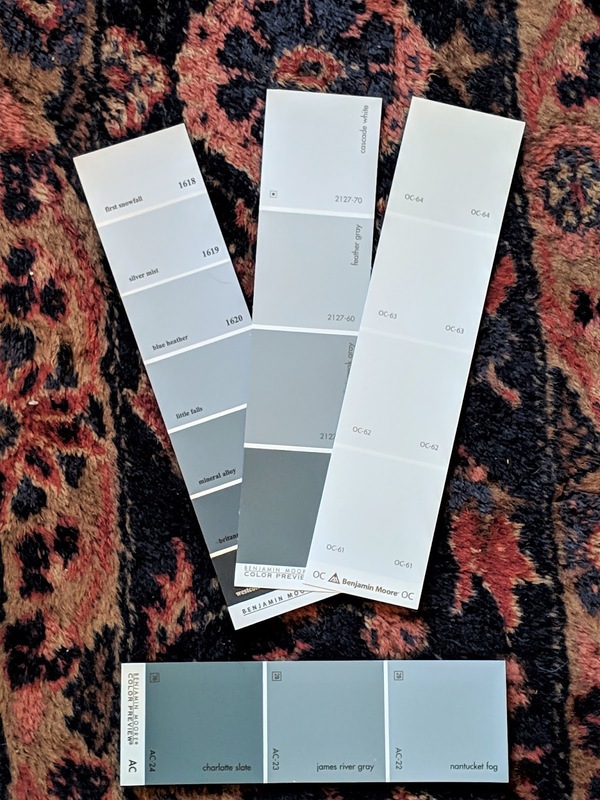 I inquired about paint colors. I thought a pale gray blue for walls, paired with a darker blue for the ceiling. 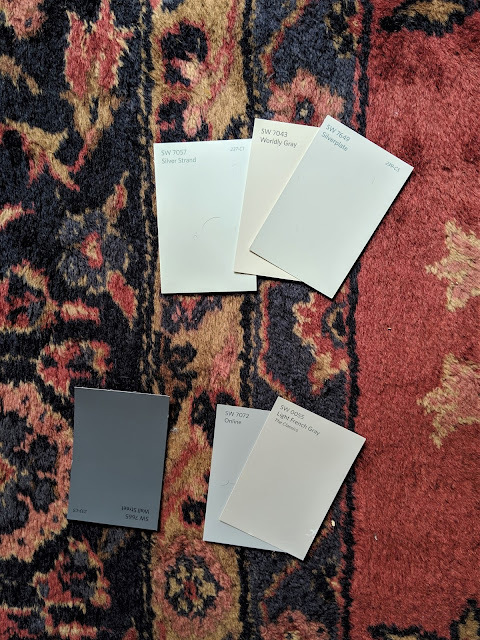 I pulled paint samples from the local Benjamin Moore outlet and brought a few choices to consider. I chose Cascade White for the walls and for the ceiling will be dressed in Mineral Alloy. 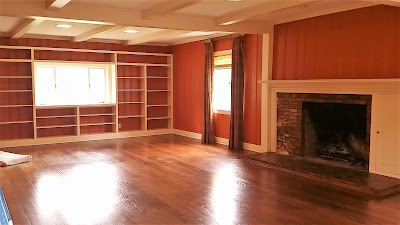 You may think that a dark ceiling will make it feel shorter, darker ceilings actually add depth. I stopped by Sherwin Williams too for samples. He was less than thrilled. "Not painting the walls white, Mom." He envisions dark moody walls, either a steel blue or wine. His favorite from the samples I brought home is the darkest shade; SW7665 Wall Street. I'll stop back by and search for wine, then we will try some samples upon a wall. For the foreseeable future I believe Jr., has sidelined the living room! Which is just as well. It will be a fun project to work on with him. I believe we have a nice foundation to begin. I'll keep you posted as we make progress. Follow me on Instagram for frequent updates. Maybe I should allow him to decide on the living room color scheme? At least he knows what he wants.... as for me, I'm still rug shopping. While making my cousin, Kathleen frustrated, sending her email, after email with links to rugs for her opinion. (Why be miserable alone?) I'm hopeful for rug love, unfortunately - I'm fickle.